Nestled in the heart of Chapelizod Village, and on the doorstep of the Phoenix Park, is St Laurence's NS, under the patronage of the Church of Ireland. 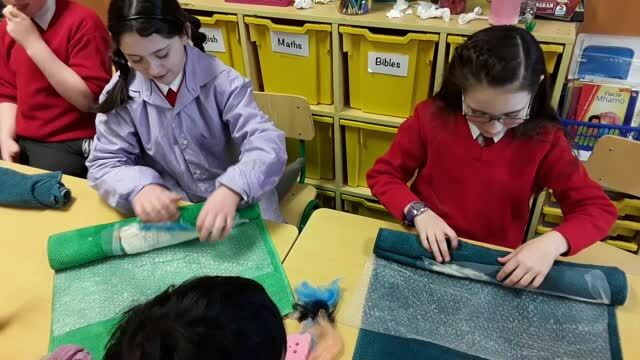 St Laurence's is a small two class primary school offering an unrivalled pupil/teacher ratio and a welcoming and inclusive atmosphere for all our pupils. Check out website for information and news about St Laurence's. St Laurence's certainly got into character for World Book Day 2019. Each pupil came dressed as their favourite book character and what an array of characters we had - do you recognise any????? What a great day and, hopefully, this enthusiasm for books will continue throughout the year. Bhíomar an-gnóthach i rith Seachtain na Gaeilge i mbliana! We ran a Siopa Cáca bake sale and raised over €100 for Barretstown. 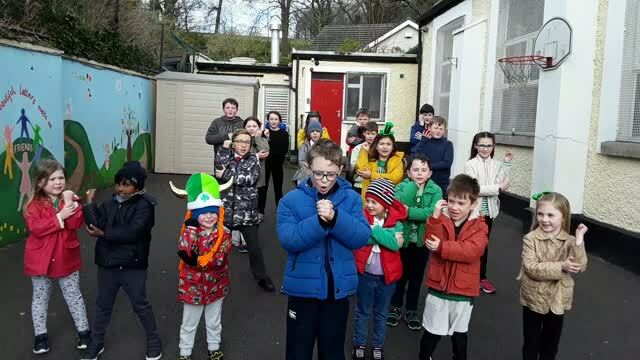 We learned the Hakka Gaelach and roared our Irish verbs ferociously! We combined the classes to hold a massive game of Biongó. We took our cúpla focal out into the community and went to visit our senior friends at Glenaulin Nursing Home. The week culminated in a Lá Glas agus Seó Tallainne íontach ar an Aoine - bhíomar bródúil as iarracht ár bpáistí, rinne siad a ndícheall ar fad! CONGRATULATIONS TO THE SENIOR ROOM!! Huge congratulations to our Senior Room pupils, who represented St Laurence's so well at the Palmerstown Credit Union Quiz, held at Pobalscoil Iosolde on Friday 1st February. Our Under 11s were joint winners, before being narrowly defeated in a nail-biting tie-breaker round to finish in a fantastic 2nd place. Our 6th class girls also made great waves in the Under 13s competition, scooping 3rd prize in the end. We are very proud of them and thanks to all the parents who came along to support them on the night.